Dixie Chicks are an American music group composed of founding members (and sisters) Martie Erwin Maguire and Emily Erwin Robison, and lead singer Natalie Maines. The band formed in 1989 in Dallas, Texas, and was originally composed of four women performing bluegrass and country music, busking and touring the bluegrass festival circuits and small venues for six years without attracting a major label. After the departure of one bandmate, the replacement of their lead singer, and a slight change in their repertoire, the Dixie Chicks soon achieved commercial success, beginning in 1998 with hit songs "There’s Your Trouble" and "Wide Open Spaces". 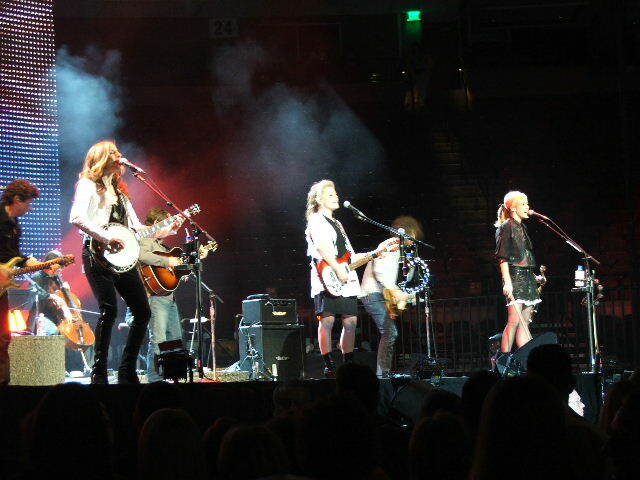 As of 2015, the Dixie Chicks had won 13 Grammy Awards, including five in 2007 for Taking the Long Way—which received the Grammy Award for Album of the Year—and "Not Ready to Make Nice", a single from that album. By December 2015, with 30.5 million certified albums sold, and sales of 27.5 million albums in the U.S. alone, they had become the top selling all-female band and biggest-selling country group in the U.S. during the Nielsen SoundScan era (1991–present).On March 10, 2003, during a London concert, nine days before the 2003 invasion of Iraq, lead vocalist Maines told the audience: "We don’t want this war, this violence, and we’re ashamed that the President of the United States (George W. Bush) is from Texas", which garnered a positive reaction from the British audience contrasting with the negative reaction, and ensuing boycotts, in the United States, where talk shows denounced the band, their albums were discarded in public protest and corporate broadcasting networks blacklisted them for the remainder of the Bush years. After a touring hiatus, they toured again in 2010, 2013 and 2016.